Most of us know Sicily as a charming travel destination; the rocky, mysterious, venue of Punic wars, where Cyclops lurked brooding in his cave, and Mt. Aetna, the island’s fiery host and parent, still puffs its smoky clouds at an otherwise cloudless sky. But Sicily was also home to many early Christian saints, and the arena of their martyrdom. The fertile island had long occupied an important place on the map of the known world by the time of the birth of our Lord Jesus Christ, and Christianity spread there from apostolic times. One of the first saints of that ancient island is the Holy Hieromartyr, Pancratius of Taormina. St. Pancratius, Bishop of Taormina, was born when our Lord Jesus Christ yet lived upon the earth. The parents of Pancratius were natives of Antioch. Hearing the good news of Jesus Christ, Pancratius' father took his young son with him and went to Jerusalem in order to see the great Teacher for himself. The miracles astonished him, and when he heard the divine teaching, he then believed in Christ as the Son of God. He became close with the disciples of the Lord, especially with the holy Apostle Peter. It was during this period that young Pancratius got to know the holy Apostle Peter. After the Ascension of the Savior, one of the Apostles came to Antioch and baptized the parents of Pancratius together with their entire household. When the parents of Pancratius died, he left behind his inherited possessions and went to Pontus and began to live in a cave, spending his days in prayer and deep spiritual contemplation. The holy Apostle Peter, while passing through those parts, visited Pancratius at Pontus. He took him along to Antioch, and then to Sicily, where the holy Apostle Paul then was. There the holy Apostles Peter and Paul made St Pancratius Bishop of Taormina in Sicily. St Pancratius toiled zealously for the Christian enlightenment of the people. In a single month he built a church where he celebrated divine services. The number of believers quickly grew, and soon almost all the people of Taormina and the surrounding cities accepted the Christian Faith. St Pancratius governed his flock peacefully for many years. However, pagans plotted against the saint, and seizing an appropriate moment, they fell upon him and stoned him. Thus, St Pancratius ended his life as a martyr. Taormina, Sicily, with Mt. Aetna in the background. 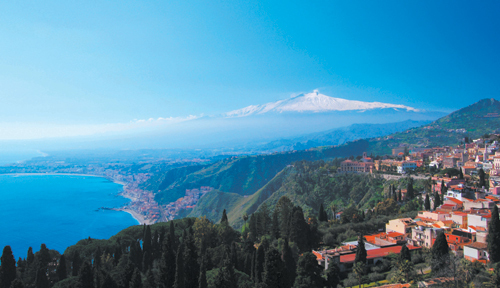 The town of Taormina is located on the eastern side of Sicily, on the Ionian Sea. The ancient city is perched on a tall cliff, as was the custom during more dangerous times, to avoid attack by sea. Along the road leading to the funicular that takes tourists from the scenic town back to their seaside hotels stands a church dedicated to the town's patron, St. Pancrazio, or St. Pancratius. It was originally built on the ruins of a Greek temple dedicated to Jupiter Serapis. Parts of the temple’s cell can still be seen in the southern wall of the church. This church is in Barocco style and dates back to the second part of the 16th century. It is built of stone from Taormina. Two oil paintings on canvas hang above the two minor altars on the right of the church, one picturing the torture of St. Nicone and the other the consecration of St. Maximus who was St. Pancratios’s successor. A fresco picturing the torture of St. Pancras can be seen on the right of the main altar. The church of St. Pancratius, Taormina, Sicily. Photo: Giovanni Dall'Orto.